Poor Arthur had to have his surgery today. Initially it was to remove some lumps on his chest that were looking infected and a bad tooth. Turned out he needed another tooth on the other side of his mouth removed too. He gets OCD on nicks and cuts so that if he doesn’t wear his cone then he will pick and scratch until it’s a gaping wound the next morning. As an extra precaution he’s also wearing one of my husband’s old t-shirt so he doesn’t scratch out his stitches. It’s amazing to me that at almost 12 he is still here and happy because of his need to pick at himself mixed with his many allergies. He’s allergic to his vaccinations, to grass, and to mushrooms. We figured out the mushrooms because he got into the trash one night and ate the left over mushroom souffle and by the next morning he had huge puffy ears and was rubbing himself all over miserably. He had to wear the cone of shame and have his ears wrapped that time. 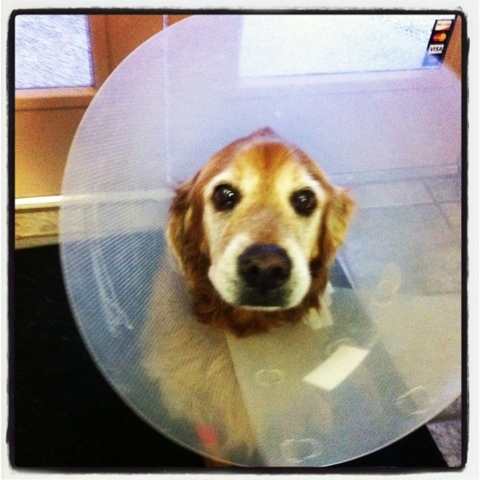 This entry was posted in Project 366 and tagged allergies, cone of shame, dog, golden retriever, Instagram, project 366, retriever, surgery, vet. Bookmark the permalink.